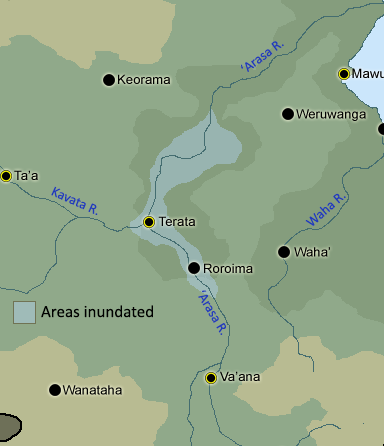 MATANGA, Terata –Thousands of kilometres square of land area were reportedly flooded last night (12/04), due to the sudden overflow of ʻArasa river. Two major cities along the riverbanks are also inundated along with hundreds of thousands of hectares of soon-to-be harvested rice fields. The kingdom of Reya, where most of the river flows, bore the brunt of the floods. Terata, the capital of Reya, are among the victims of the flash floods. Economy activities were halted, with most of the city transportation crippled due to the inundation of almost all neighbourhoods in the city. Vaʻana, a major city further upriver, fared much better due to its higher elevation. The floods took no one by surprise, yet some were still unprepared. Heavy downpour in Wusanga mountains throughout the week prompted the Federal Disaster Mitigation Agency (TVWA) to issue alert for people living along the riverbank of ʻArasa river, the longest and largest river in Selayar in terms of volume discharge. The river is also infamous for causing the deadliest natural disaster in the history of Selayar, the 1938 ʻArasa River Floods, which took almost two hundred thousand of lives and still floods occasionally during monsoon. People had been evacuating to higher grounds away from the river from Wednesday this week (10/04), though some had started returning by Friday. Prime Minister Huti Manaranga stated that relief is on the way, and had declared state of emergency in Reya. He also apologised for the government's inaction that led to the disaster. Previously, the nation had been flood-free for six years. Evacuation camps are being set up on the dry area around the inundated area, and police along with military have been deployed to help to evacuate citizens that are still stuck in the inundated area. This year's summer monsoon has seen an anomalously high downpour in the south and the west, and the Bureau of Climatology and Meteorology (RTM) had forewarned dangers of floods and landslides. Experts alike warned that this might not be the only flood disaster this year, as other rivers have seen a high amount of discharge lately. Carrier strike groups take part in maritime exercise in the Ranke Sea. The Imperial Navy Command announced Today that Maritime forces Perya, consisting of the 4th Carrier Strike Group and the 2nd Carrier Strike Group are participating in a naval security exercise (NSE) in the Ranke Sea, over the next few days. The 4th Carrier Strike Group, composed of aircraft carrier HIN Tyfhc Mekrd (Dawn's Light), AA-class air defense destroyer HIN Creamt(Shield), and the Cfunt-class frigate Terath, along with the 2nd Carrier Strike Group, composed of the aircraft carrier HIN Osis, guided-missile cruiser HIN Najor, and guided-missile destroyer HIN Jawlein, are going to be conducting dissimilar aircraft training, a nighttime gun exercise (NGEX), and a photo exercise. The Imperial Navy has had an issue in the past with its territorial waters being the subject of breach by those within and beyond the Occidental Region. To combat this, the HIN will be conducting exercises in support of regional security and stability. The exercise concludes with a photo exercise, capturing the strength through unity that national navies have while operating. Fleet area of operations in support of naval operations to ensure maritime stability and security in the Occidental Region, connecting the Ranke Sea and strategic choke points near the edges of Haru territorial water claims. Televisions across the country flicker with static as the broadcasting service lies in wait. A voice begins to transmit through the storm of static as the image on the screen begins to clear. A swirling assortment of colors flutter across the screen as a 3D globe spins. Blue and white bars swirl around the globe and for the letters "S," "B," and "C." A voice speaks as the color begins to fade. "Thank you for tuning in to SBC, I'm Emilia Sada,"
"And I'm Marco Messore. Stay tuned for the most trusted Alenian news. Politics, interviews, and much more are to come." It has come to the attention of the Agios Basilikon Kounsistorion, the Imperial Government of Tagmatium, that it is not just the rogue nation of Derthalen that still maintains the barbaric and savage practice of slavery. There are many others that still pursue this crime, one that all civilised nations think has been consigned to the history books. However, this is not the case. Some nations, backwards and savage as they are, still accord it more than revulsion. They openly and willingly enforce it on their own citizens and, indeed, trade their own citizens with other barbaric nations. That it still exists is inexcusable and one that all right-thinking nations must make a stand against. That these vile nations still carry this bestial trade out must be stamped down upon. In this modern age, this is entirely unconscionable that slavery still exists; it is an affront to the modern notions of self-determination and to God Himself. That these nations, these slaver-states, feel that they can continue with this abhorrent trade entirely unmolested is itself arrogance of the most extreme and noxious sort. They will find themselves disabused of this belief. In the past, the Megas Agios Basileia Arhomanion was famous, nay, infamous for its use of slavery. In these ancient times, slavery was common and it played an important and well-defined role not just within the economy of Tagmatium, but in wider society, too. Manual labour was not the only role undertaken by slaves, but almost every profession as well. Whilst these slaves were often well treated by their masters, they were still the property of their owners, as much as those who were worked to death in brutal conditions in mines or the fields. They all could be subjected to sexual exploitation, torture or even summary execution, all at the whims of their masters. As Christianity took root and Tagmatium slowly threw off the shackles of the old, ignorant superstitions that had formerly held sway over its populace and the state, it became clear that it was against the virtues that were now held dear. Slavery is an affront to God. It is nothing more than one of the most base acts of covetousness and an act of human rebellion against our true Father. As such, as the Agios Basileos kai Autokrator Arhomanion is the representative of God on Eurth, it is decreed by the Agios Basilikon Kounsistorion that it cannot be stomached that slavery is allowed to continue without punishment of those who defy God in this manner. As the Megas Agios Basileia Arhomanion is looked on as the shining beacon of civilisation on Eurth, one that all other nations follow as the example to live up to, it follows that it will be the first to truly step up to the mark and take a stand against these slaver-states and their abominable trade. As such, any nation that has on its statute books slavery, indentured workers or similar practices or ideals, whether directly or indirectly, or indulges in the trade or sale of their own citizens, or those of foreign nations, will find themselves with the following sanctions levied against them. These are in line with those that have been placed against the rogue nation of Derthalen and will continue to be maintained until that nation, and those that hold the foul institution of slavery dear, change their ways and enter into these modern times. There may be those that feel that Tagmatium is overstepping its reach, that it has no right to attempt to police the internal policies of other nations. The Agios Basilikon Kounsistorion feels that this is not the case – that to allow slavery in its many forms to continue is to encourage it. If it is not stamped out sooner rather than later, it will spread, a dark plague from history that will once again become a dark blot on the world. The Agios Basilikon Kounsistorion will expel any non-essential diplomatic personnel that any slaver-state has within the Megas Agios Basileia Arhomanion. The Megas Agios Basileia Arhomanion will cease trading in any way with any nation that maintains slavery or similar, or backs the trade in any way; it will send no products to these nations, nor will it accept any items of any sort made in them or by companies owned by their nationals, whether in part or wholly. Any property and assets, financial or otherwise owned by nationals from these states within the Megas Agios Basileia Arhomanion will be seized. This will include assets and properties owned by either individuals working for the the governments of these nations or entities and organisations based in those nations. It will then be disposed of, kept or sold in a manner that best benefits the Megas Agios Basileia Arhomanion. Vessels owned by nationals or entities based in these nations or sailing under their flags will be turned away from Tagmatine waters, as defined by the Megas Agios Basileia Arhomanion. However, any vessel will not be turned away if there is a danger to the lives of those on board or those on other vessels. Any such vessels, owned by nationals or entities based in these nations or sailing under their flags, within Tagmatine waters, as defined by the Agios Basilikon Kounsistorion, or ports will be escorted from them along the shortest possible route, so long as that does not pose any danger to any vessel involved. Aircraft based in these nations will ﻿no longer be able to land or use airfields in the Megas Agios Basileia Arhomanion, nor pass through Tagmatine airspace. An exception to this would be if there are emergency circumstances, which will be defined at the discretion of the Agios Basilikon Kounsistorion. Any aircraft from these nations currently within Tagmatine airspace will be escorted from it via the shortest route, so long as that does not pose any danger to said aircraft or others, whether on the ground or also in the air. A travel ban will be set against members of these nations' governments and those suspected of being members of said governments. The Agios Basilikon Kounsistorion reserves the right to place further travel bans against any nationals it is suspected that are working in the interests of their government, rather than as private individuals. Any individual from these nations attempting to gain entry to the Megas Agios Basileia Arhomanion will be turned away from its borders before entry. Individuals from these nations, if it is suspected that they are working for their governments or in the interests of their government, in an espionage capacity or otherwise, will be escorted to the borders of the Megas Agios Basileia Arhomanion and expelled. It will be an offence, with a penalty of up to ten years in prison and/or an unlimited fine, for a citizen of the Megas Agios Basileia Arhomanion to trade with a company owned whether fully or in part by an individual from these nations, or an individual from these nations. If these sanctions are perceived as having no impact on the nations that they are levied against, if they continue in their monstrous and blasphemous trade and beliefs, then the Megas Agios Basileia Arhomanion will consider what steps to take next. Those that still pursue slavery; be warned. Tagmatium has a long reach and the means to make sure that slavery does not last all that much longer on Eurth. May God bring those nations around to civilisation and guide their people, and may He break the chains of every slave, whatever their oppressors may call them.